Ravenna, with its extraordinary artistic and cultural treasure, attracts tourists and art lovers from around the world. Three times capital of three empires, the Western Roman Empire, the empire of Theodoric King of the Goths and the Byzantine Empire in Europe, Ravenna retains traces of this glorious history in its basilicas and baptisteries, which constitute the most rich human heritage of mosaics dating from the fifth and sixth centuries. RAVENNA HAS EIGHT MONUMENTS INCLUDED IN THE UNESCO WORLD HERITAGE LIST and the DANTE’S TOMB, WHERE THERE ARE CONTAINED THE BONES OF THE SUPREME POET. Approaching this small building does not imagine that the simple exterior hides in a few square meters so beautiful mosaics, the most ancient of Ravenna. The emperor Honorius (who moved in 402 the capital of ‘the Western Empire from Milan to Ravenna) to want this mausoleum to dedicate it to his sister Galla Placidia. The funerary character of the building is confirmed by the theme of the mosaic decorations, or the victory of life over death, represented by a series of scenes that recall the Christian and Greco-Roman iconography. But it’s the stars reproduced on time to hit more than anything the imagination of visitors and to remain imprinted forever in the eyes. This octagonal basilica, consecrated in 548 by Archbishop Maximian, is among the most important monuments of early Christian art in Italy. Not only for the splendor of its mosaics, but also to how the influences blend of oriental art, architecture and decoration, the Western tradition. 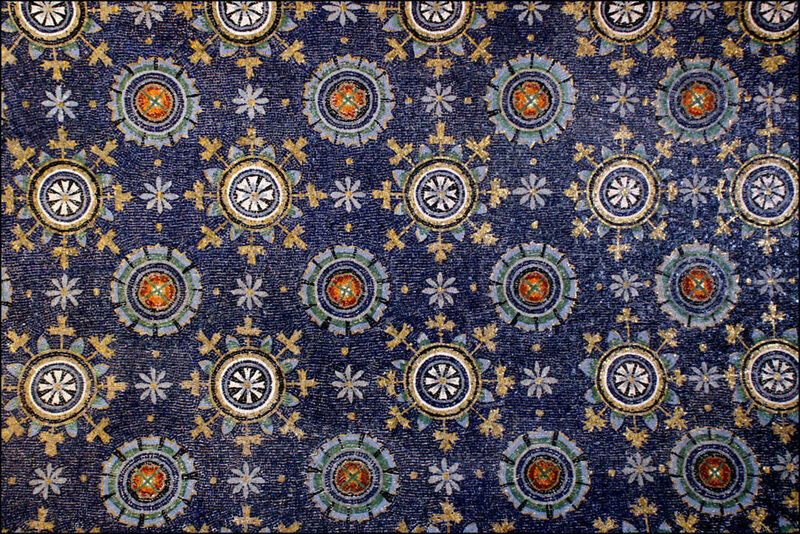 The mosaics are the stars of the Basilica, starting from the magnificent representations of the court of Emperor Justinian and his wife Theodora, but the magic of San Vitale does not stop there. Just look for example at the floor, where you can see a series of concentric circles with arrows: it is a maze, often present in Christian churches, and a symbol of the output path from sin toward purification. If you want to try to get out of the labyrinth, we give you a little help: it starts from the center, to discover the rest of you. Not to be confused with Sant’Apollinare in Classe is located outside the historic center, 8 km from Ravenna, the Basilica of Sant’Apollinare Nuovo was so named to differentiate it from another city church bearing the same name. Built by Theodoric, right next to his palace – the remains of which are still visible – this basilica is home to the largest cycle of mosaics in the world. The walls of the nave are divided into three distinct bands of mosaics: the high beams on the life of Christ, the central Saints and Prophets, and the lower one portrays the famous Palace of Theodoric. 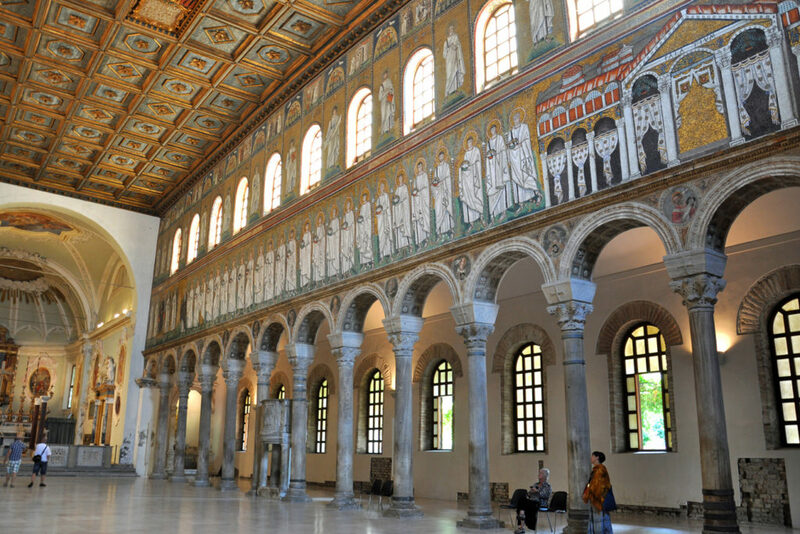 The cancellation of the figure of the Emperor and other characters, covered with white drapes, happens when the basilica pass by Arian cult (for which it was built) to Catholic worship. On the opposite wall is a portrait of class port, one of the most important in the Mediterranean during the Roman Empire. 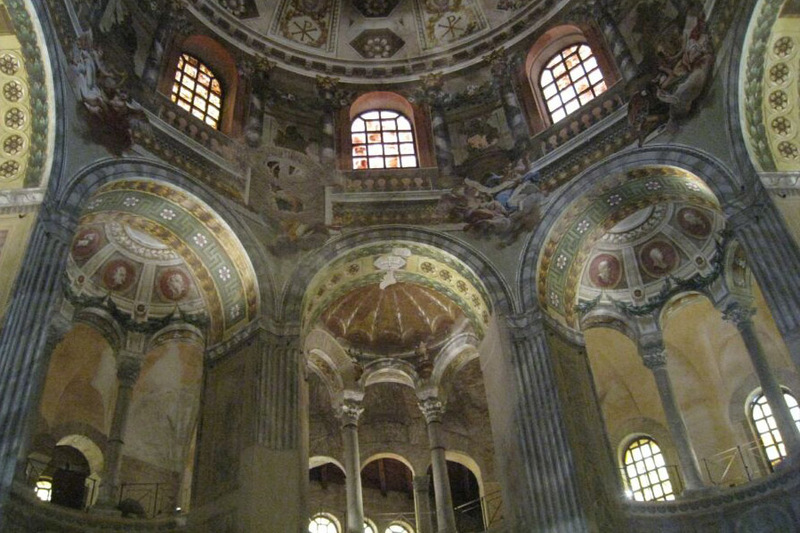 Between the basilicas of Ravenna it is the most imposing and majestic. The mosaics compete in beauty those of the other churches in the city and depicting Christ surrounded by the four evangelists, while the sheep symbolize the apostles. The face of Jesus appears in the center of the Cross, in a medallion decorated with 99 stars. All showing takes place between the sky and the enchantment of a heavenly rich green landscape of rocks, trees, flowers and colorful birds. 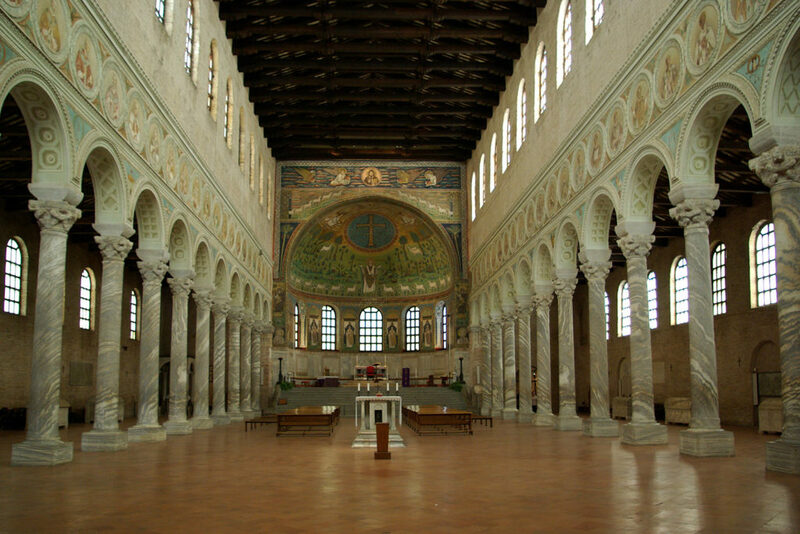 Today the Basilica of Sant’Apollinare in Classe is located 8 km from the center of Ravenna and a few kilometers from the sea, and when it was built was located by the sea. Next to the basilica, there are excavations of the great archaeological area of the city of Classe, the seat of the Roman fleet in the Adriatic. 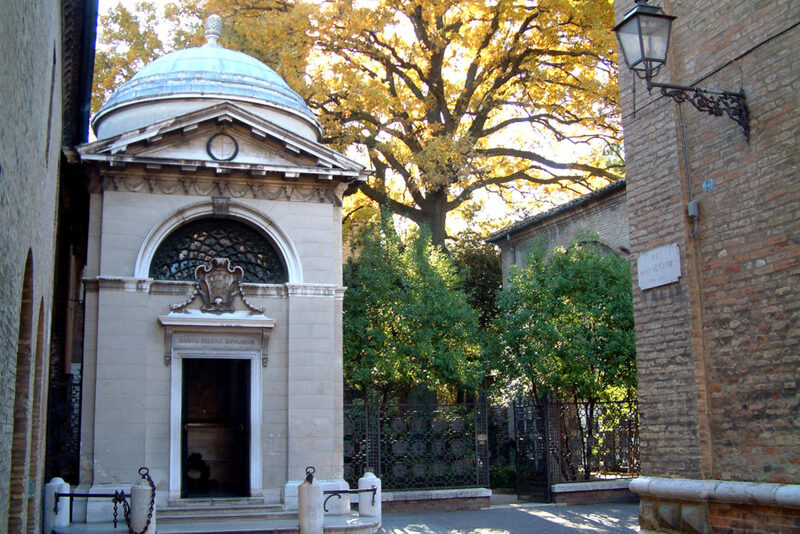 For many it is a surprise to find that Dante’s tomb lies in Ravenna, not Florence. Dante died in Ravenna during his exile and, despite repeated attempts to return it to its native city, is still here. The Franciscans of the nearby monastery and stole jealously preserved the bones of Dante for several centuries, opposing the will of sovereigns and popes to return the remains to Florence. They were always to save them from the bombings of World War II. Today to remember Florence and Tuscany there is the eighteenth-century votive lamp fueled with olive oil of the Tuscan Apennines, which is given annually by the city of Florence, in a ceremony that takes place on the second Sunday of September. 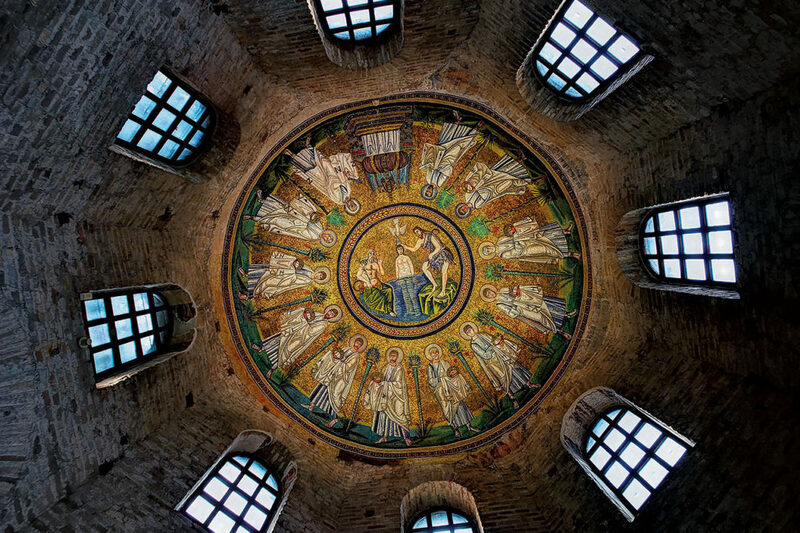 The Arian Baptistery in Ravenna was built during the reign of Theodoric, when Ravenna was the capital and Arianism was the official religion of the court. Arianism has always been considered a heresy of Christianity because according to the Aryan doctrine of Christ was the son of God but retained his human nature, believing that only through the ritual of baptism the divine nature was communicated to Christ. The mosaics on the ceiling of this baptistery celebrate their baptism of Christ. Unlike near the Orthodox Baptistery, here the young Christ is not represented as coming from the East, but heads towards the east, becoming divine only in the moment of baptism. He is a man, so there is no “censorship” on her nakedness, while immersed in the waters of the Jordan, and John the Baptist communicates Baptism. It descends from the divine dove, to spray with a puff of light, symbol of the Spirit, the head of Christ. 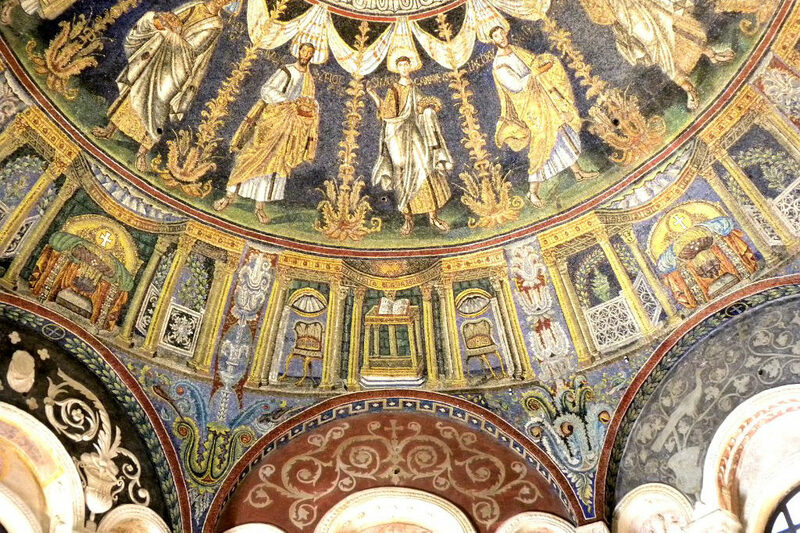 The Neonian Baptistery was the Catholic response (the Bishop Neon) Aryan heresy, who in Ravenna had its zenith during the reign of Theodoric. A contrast that is also found in Christ depicted in the mosaic under the dome, which unlike that in the nearby Arian Baptistery comes from the East and is divine also communicated before baptism by John the Baptist and the divine Dove. It is said that Carl Gustav Jung (the famous psychologist) during a trip to Ravenna in the 30’s saw in Neonian a mosaic representing Christ and extends his hand to Saint Peter who is about to drown. Only much later, when he tried a picture of Neoniano, he realized that that picture did not exist and had been a figment of his imagination. Jung used the episode to write beautiful pages on the relationship between the unconscious and consciousness and how even the imagination alter the way we see reality.